Sometimes you just don’t feel like washing your face - it happens. 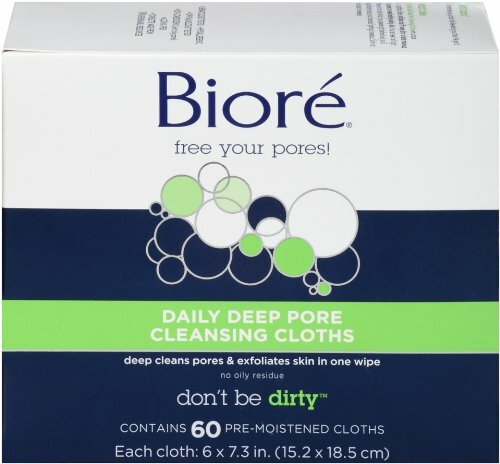 On those days, reach for Biore Daily Deep Pore Cleansing Cloths. Each pre-moistened cloth has dirt-grabbing fibers that exfoliate skin and lift away dirt, oil, and makeup from your pores, revealing healthy-looking, glowing skin. Toss them in your gym bag for a pre-workout cleanse, or into your carry-on bag for freshening up during travel. They’re oil-free, alcohol-free, and guilt-free, because there’s way better stuff to feel guilty about than not washing your face...like your reality TV addiction. Wipe over entire face to dissolve away dirt, oil, and make-up. Leaves no residue, so no need to rinse. Dispose of cloth in trash receptacle - do not flush. Best if used within 45 days after opening. Keep package tightly closed and store in a cool, dry place when not in use. Biore Skincare targets the root of all skin problems-the evil clogged pore. So when it comes to dirt and oil we take a no nonsense approach to fight smarter, not harder. Our scrub, liquid, powder, strip, mask and bar cleansing products go straight to the source of those pesky pores for deeply clean, beautiful skin.